Halloween is just around the corner and if you’ve got kids at home, they probably can’t wait for the best part- trick-or-treating! 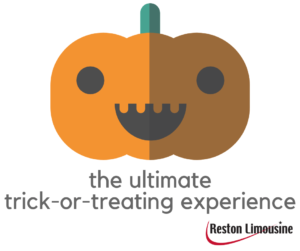 Well, Reston Limo is giving away the ultimate trick-or-treating experience for your kids! We’re raffling off 5 hours of van terra service so up to 13 of your kids and their friends can trick-or-treat on wheels all over the DC area, in style and safety! Map a route to the best candy all around and enjoy the sights and sounds of Halloween from the comfort and luxury of a spacious van terra. 5 hours of luxury van terra service for the ultimate trick or treating experience. No purchase necessary – just click below to fill out the form and sign up for our weekly e-newsletter to enter! Entries open at midnight October 9th and close at noon on October 23rd.